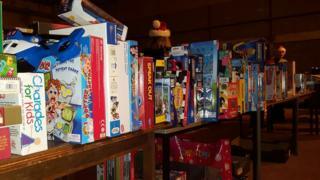 Organisers of a toy appeal for children living in poverty say they have seen a 40% increase in demand this year. The Carmarthenshire Christmas Toybox Appeal said this was partly due to concerns about the new benefits system Universal Credit. The closing date had to be extended and a last-minute appeal made to collect 1,000 additional gifts. A UK government spokesman said the new benefits system was fairer and "people can claim up to 100% advance payments". Universal Credit came into force across the county on 12 December. It brings together six benefits into one payment and is paid once a month - in arrears. While this has worked for some, other claimants have said it is this delay in payment, combined with confusion over the online application process, that has seen families left with no income for weeks. Marie Griffiths, one of the appeal's organisers, said they had collected 5,000 gifts - 2,000 more than last year. But she said they were still 1,000 presents short of their target, so had extended the deadline until Christmas Eve. "There's been a large increase in the numbers nominated by schools, social workers and other bodies," said Ms Griffiths. "It's a big change from last year, but there are children out there on our own doorstep that won't receive presents this year." Mair Stephens, deputy leader of Carmarthenshire council, said: "Yes, there is more poverty around, but they are also worried about the new benefit system. "They are worried they will have to be without payments for up to five weeks and they are holding back." A Department for Work and Pensions spokesman said: "Universal Credit has been a force for good in many cases and Jobcentre staff are committed to ensuring people get the right support this Christmas. "People can claim up to 100% advance payments from day one and budgeting support is also available."